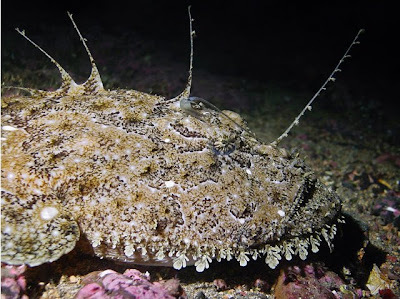 The Monkfish is a name used to referred to several different species of saltwater fish including Lophius piscatorius. These fish, much like the Stonefish and Frogfish, are masters of camouflage. Monkfish have a series of appendages that look much like seaweed, and help them to blend in perfectly. They lie in wait on the bottom and use a "lure" of sorts that comes out of their heads. This "lure" is actually their first dorsal spine. As its prey gets close this fish will suddenly open its mouth and the suction brings the prey quickly into the Monkfish's mouth. They are able to swallow fish almost the same size as them due to their expandable stomachs! Lophius piscatorius goes by a few different names throughout the world including the Anglerfish, Fishing Frog, Frogfish and the Sea Devil. These odd creatures are found in waters of up to 120 meters in places like the Northeast Atlantic, Mediterranean Sea, Black Sea and Barents Sea. Reaching lengths of 2 meters and weighing in at 60kg, much of their weigh and length is in their heads. 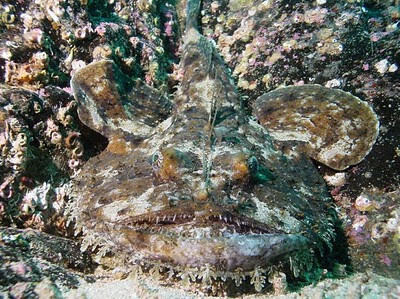 This species of Monkfish have two large rounded breast fins that are located behind their heads. They use these breast fins as a stabilizer when they are laying on the bottom. You can check out the Monkfish in the videos below. We are not able to tell if these species are indeed Lophius piscatorius. If you have any questions or comments about the Monkfish leave us a comment below.